The gravimeter used is a relative instrument: it measures the difference in g between two locations. It was calibrated at the start and end of the expedition against the known absolute value of g at Arusha Airport of 977619.08 mGal, data obtained from the international database of the Bureau Gravimetrique International. Figure 10, Figure 11 and Table 1). The calibration at either end of the expedition also allowed instrument drift to be checked and calculated. Gravimeters drift as imperfections in the crystalline structure of the metal resulting from manufacture anneal over time. Although the instrument is old and one of the most stable in Europe it was necessary to establish the drift so that corrections can be made and to ensure that transport over rough terrain during the expedition had not upset the instrument. Table 1 Calibration of gravimeter at start and end of expedition at Arusha Airport. Lacoste-Romberg Model G Gravimeter number 275 belonging to Edinburgh University. Value of g from BGI database record number 107490 is 977619.08 mGal. Drift calculations were made whenever repeated measurements were obtained at the same location (Figure 12). In all three sets of drift readings were obtained: at Arusha airport, the village of Gelai and the base camp at Lengai. The Lengai base camp measurements show a lot of instability. This included periods when the gravimeter was not being carried up the volcano so jolting of the instrument is unlikely to have been the cause. Movement of the gravimeter baseplate on unstable volcanic sands during measurements may have been the cause. All the values show the machine reading increased with time. The Gelai and Arusha data suggest a drift rate of 0.01 – 0.02 dial turns per day respectively. The Arusha data, gathered over a longer time period, are assumed more accurate and have been used to correct the gravity measurements. Figure 10 Calibration of the gravimeter against the known value of g at Arusha Airport on 19th July 2004, at the start of the expedition. The gravimeter and its case are at the foot of the pillar which forms the corner of the veranda. Although the airport has expanded considerably since the survey point was established in 1961, the precise location was easily identified as the foot of the pillar. 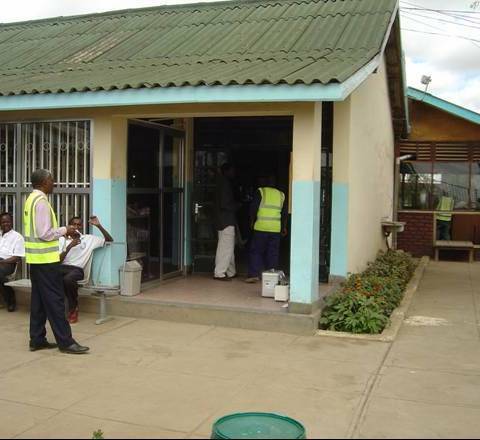 Expansion of the airport is being considered, but should this point be destroyed, others are available in Moshi. Figure 11 Location of the gravity reference point at Arusha Airport. From the BGI database, see text for discussion. Figure 12 Drift calculations for the gravimeter. Green triangles show the two meter readings obtained at Arusha airport. Purple squares show repeat readings obtained at Gelai, where the rift valley surveys from Kitumbeine and Keri Masi were joined. Blue diamonds are repeat readings from the base camp at Lengai. The large scatter in the readings from Lengai base camp may be due to movement of the gravimeter base plate on the volcanic sands. Data were collected over the course of several days in collaboration with the survey fire (Table 2). The logistical complication was always the need to be acquiring GPS simultaneously in two places (differential mode) in order to obtain the accuracy of position required. The first day of measurements in the rift valley was a day when the expedition was moving by vehicle and foot from Longido to Kitumbeine. A single Landrover was used to hop the gravimeter and one GPS receiver forward and then, whilst measurements were being taken, return to pick up the other GPS receiver. The radios available worked only on line-of-sight which was not far enough to cover each step, so GPS measurements had to be synchronised to pre-arrange times which was inefficient. Measurements between Kitumbeine and Gelai were obtained on a day when the expedition was not moving and two Landrovers were used, one for each GPS receiver, which speeded up measurements considerably. For the points between Gelai and Keri Masi, one GPS receiver was left at Keri Masi base camp, and the remaining GPS receiver moved with the gravimeter in a much more efficient manor. Lack of a continually-occupied base camp precluded this on previous days. 30th July Ol Doinyo Lengai summit down to 1941m asl. 31st July Ol Doinyo Lengai 1842m – 1175m asl. Table 2 showing data collection. Figure 13 Gravity surveying in the village of Longido with an audience. The gravimeter was placed directly beneath the GPS receiver (on the tripod) wherever possible. 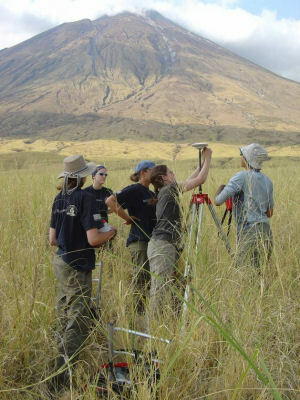 Figure 14 Surveying between Kitumbeine and Gelai. 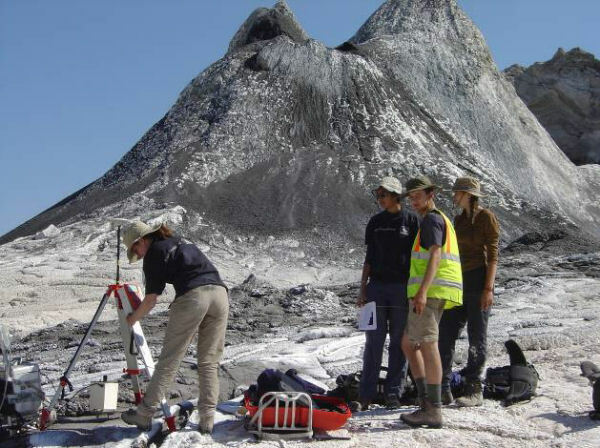 The feasibility of gravity surveying on Ol Doinyo Lengai was unknown before the expedition. 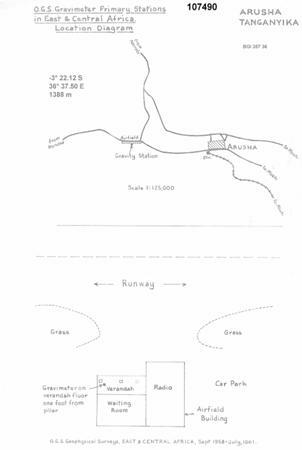 However the path is navigable with the equipment divided into four loads (GPS receiver, Tripod, Gravimeter, warm clothes and water) and the measurements obtained by ascending during the cool of the night and surveying on the decent (Figure 15, Figure 17). 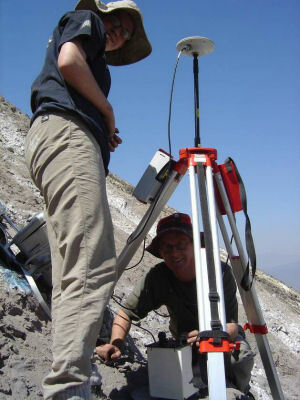 The second GPS receiver was maintained at the base camp, and radio communications good, with cams at the foot and the summit of the volcano, and measurements were obtained wherever reasonably flat ground could be found (Figure 16). To help distinguish the gravity anomaly of Lengai from that of the Rift Valley, measurements were taken in the Rift Valley in front of Lengai (Figure 18). Measurements were also taken on the Serengeti Plateau, the hanging wall of the rift valley, to ensure coverage of the Rift Valley anomaly. Figure 16 Finding flat ground on Lengai was not easy. 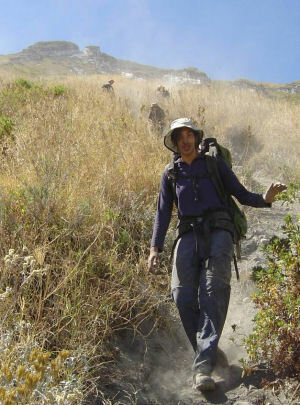 Figure 17 Descending Ol Doinyo Lengai after the gravity survey. Figure 18 Setting up the GPS receiver during the gravity profile along the front of Ol Doinyo Lengai. 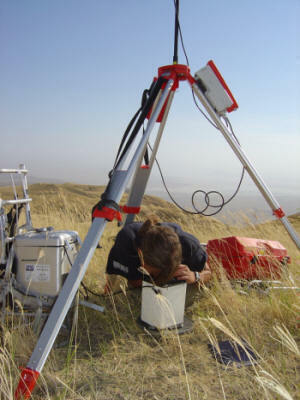 Figure 19 Gravimeter reading on the Serengeti Plateau, with Lake Natron in the background.